We start 2019 by announcing January’s member of the month – Andrew White. Andrew was unanimously nominated by the Motive8 team. And can I just say that I have never seen someone so excited to get a free drawstring M8 bag and keyring! 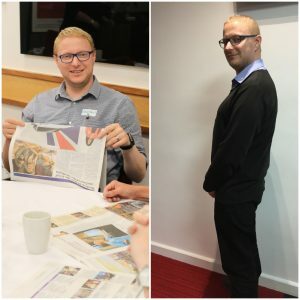 Not only has Andrew lost half a stone since joining, he always seems chirpy! He joins in with the monthly challenges, has taken part in the fitness testing, and always makes conversation with the staff. We think he’s great! How Long Have You Trained At Motive8 For? What Were Your Goals When You Joined – And Have They Changed? A – The only goal I had was to lose weight. But that has since changed as whilst I have lost weight; I feel like I am able to push myself and my targets. For example, I have never run on a treadmill before and believed I wouldn’t be able to run half a kilometer before I needed to stop. But I have run 4.6k recently without stopping – it just goes to show that with a little confidence and willpower you can smash your goals! Why Do You Enjoy Working Out At Motive8? A – I enjoy working out at Motive8 as no one bothers you – you can just get on with what you want to do. That’s a good thing by the way! It’s also very close to work which is ideal for me. A – More goals! To lose another stone and a half in weight. I’m also pushing how far I can jog and how fast I go. If you’re interested in joining our gym, click here for more information.